Depending on the tour, the season for canoeing will normally run from early May to late September, except for tours in the north where the season will be shorter (typically June to mid-September). Anytime during the season can be a wonderful time to go canoeing! You will probably feel you have the whole world to yourself! From May until mid-June and from mid-August onwards are very quiet times for outdoor activities in the Nordic countries - ideal for a real "get away from it all" adventure! In general (though conditions vary greatly both from year to year and also within the season), you are likely to encounter fewer mosquitoes/midges during tours at this time. Read our blog article on mosquitoes for more information. Be prepared for cooler temperatures, both in the air and in the water. For early tours especially, the water can still be very cold, so you may want to restrict your swimming to a quick morning dip! For the more challenging/remote tours, it can be a good idea to have a greater level of outdoor experience for tours at this time. For canoe tours in the north, such as our tours in Rogen in Sweden, there may still be some snow at the very start of the season, and towards September there can be some fresh early-season snowfall. Take warmer clothing for early/late season tours. Towards later August and September, especially further north, the forests begin to turn to the beautiful colours of autumn. 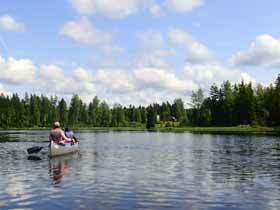 Some tours, such as Canoe on Klaräven and some of our other canoe tours in Värmland, have a minimum charge for the cost for 4 adults for tours outside the main season, as custom transfer arrangements must be made. If you are a group of 4 or more persons, this of course does not affect the price. However, we also offer many options for canoe tours which are possible at standard per person prices throughout the season, such as Canoeing in Dalsland's Lake District. 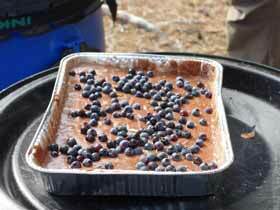 From mid-June to mid-August is high season for canoeing. At this time, you will normally have the highest temperatures, both in the air and water. In June, the water can still be cool but still very pleasant for a refreshing dip! By mid-July, depending on the temperature during the summer, water temperatures can easily be 20 degrees or more, ideal for swimming! This is also the most popular period for outdoor activities, both for Nordic families enjoying their summer holiday and for visitors from overseas, so you will normally encounter more other persons during your tour than if canoeing earlier/later in the season. However, Nature Travels specialises in small-scale, ecotourism experiences, so you are unlikely ever to feel that your experience is "crowded". 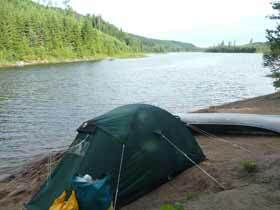 Most canoe tours feature wild camping where you choose your own camping spot each night, and the flexible nature of the many of the routes means that there is generally little difficulty finding your own space. While other persons may of course begin their tours at the same time, participants will typically spread out quickly. 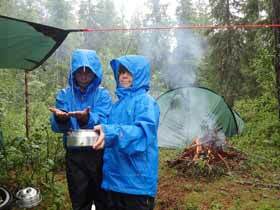 For tours with designated overnight locations, you are of course more likely to meet other campers in high season. 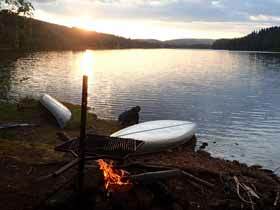 June is Midsummer, and canoeing at this time offers wonderful long days when you can be out on the water as long as you wish. Even if you are not paddling far enough north for the Midnight Sun, it will hardly be dark in the weeks leading up to and following Midsummer. 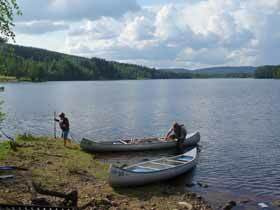 You may experience more mosquitoes/midges when paddling during high season. However, numbers vary greatly both from year to year and within the season, so you may find that you have encounter more insects than you expect or none at all. We always recommend wearing appropriate clothing, etc, to make your experience more comfortable. Read our blog article on mosquitoes for more information.